Hi everyone, we are excited to let all of you know that we’ll be attending WonderCon Anaheim March 29-31 at the Anaheim Convention Center again this year! 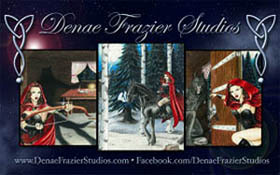 At the event, we’ll be selling Denae’s Art Prints, Art Buttons, 2020 Calendars, DFS Lanyards, Dog Tags, Magnets, Pendants and we’ll have some of her Original Art For Sale too! We will be in Artist Alley at C-36 this year! Hey everyone, come out and see on Friday (March 8th) for 2nd Friday Night Out – Mesa – SciFi Friday in Downtown Mesa. We’ll be setting up out front of Gotham City Comics and Collectibles selling Denae’s 1.5” Buttons, 2020 Calendars, 11″x17″ Art Prints, Dog Tags, Magnets, and her Pendants! Hi everyone, come out and see us Friday for 2nd Friday Night Out – Mesa – Trivial Pursuits in Downtown Mesa. Hey everyone, come out and see us Friday for 2nd Friday Night Out – Mesa – Word on the Street in Downtown Mesa. Hey everyone, we hope to see you at the 5th Annual Toy Drive Kick-Off Motorcycle & Car show on Nov. 3rd from 10am-2pm. The address for the event is 2910 W. Apache Trail, Apache Junction, Arizona 85120. Also, at the event we’ll be selling Denae’s 6.75”x10.5″ and 11”x17” Art Prints, 1.5” Buttons, Magnets, Dog Tags and her Pendants! Hey everyone, on #Halloween Day (Wednesday, Oct. 31st) from 11am-2pm we’ll be setting up out front of Gotham City Comics and Collectibles again for Trick or Treat Main St. Gotham will be handing out goodies to all the kids inside their store (while supplies last) and we’ll be selling Denae’s Art and other goodies and handing out Candy as well! We look forward to seeing all of you there in your costumes! Hey everyone, we hope to see you tomorrow (October 27th) for Halloween ComicFest! Gotham will be handing out Free Comics from 11-9pm while supplies last. Have a good weekend and we hope to see you there! Hi everyone, come out and see us Friday for 2nd Friday Night Out – Mesa – Nightmare On Main in Downtown Mesa.